When most folks think of pumpkin recipes, the first thing that comes to mind is pumpkin pie. 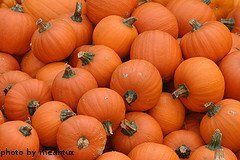 However, fresh pumpkin can also be made into stews, soups, bread, dessert bars, cookies, etc... Pumpkins taste great in both sweet and savory dishes. Before we get to some of our favorite pumpkin recipes, here is some nutrient information. Sift the flour into a large bowl. To the flour, add remaining dry ingredients and combine. Make a well in the center of the flour mixture and pour oil, pumpkin and water into the center. Blend together with an electric mixer. Add eggs one at a time, beating mixture after each egg. Stir in the walnuts. Pour the batter into 6 small loaf pans that have been well greased. Bake for one hour or until a toothpick inserted in the center comes out clean. Remove bread from pans and let cool on cooling rack. Any unused bread can be wrapped in several layers of foil and frozen. Will keep well in freezer for up to 3 months. In a large pot, boil pumpkin pieces in water until very tender. Drain and return to pot. Mash the cooked pumpkin with a potato masher. Set aside and let cool slightly. Melt the butter in a large skillet over medium heat. Add in onion, carrot and bell pepper and saute until tender. Pour this mixture into the mashed pumpkin and combine. To the pumpkin mixture, add chicken stock, half and half, sour cream, salt, black pepper, cinnamon, sage and allspice. Combine thoroughly. Place this mixture in a food processor and puree. A hand blender can also be used. In a 9 inch spring-form pan, mix together graham cracker crumbs, sugar and cinnamon. Pour in melted butter and combine. Using fingers, press crust into the bottom and slightly up the sides of the pan. Place in oven and bake 20 minutes. Remove pan from oven and let cool on cooling rack. In a large mixing bowl, combine cream cheese, 2 cups of whipped topping, powdered sugar and vanilla. Beat with electric mixer until smooth. Set aside. In another large mixing bowl, thoroughly combine pudding mix, milk, pureed pumpkin, cinnamon, nutmeg, allspice and cloves. Fold in remaining 2 cups of whipped topping. Spread half of the cream cheese mixture evenly over the cooled crust in the spring-form pan. Spoon half of the pumpkin mixture on top of the cream cheese layer and spread evenly. Spoon the remaining cream cheese mixture on top of the pumpkin layer and spread evenly. Spoon the remaining pumpkin mixture over the top and spread evenly. Sprinkle chopped walnuts over the top. Chill in refrigerator at least 2 hours. 20 minutes before serving, place cheesecake in freezer so it will be very firm before unmolding the spring-form pan. To a large pot over medium-high heat, add beef, garlic and onion. Cook until onion is translucent and beef is evenly browned. Drain off the fat. Turn heat up to high. To the beef mixture, add rice, water, salt and black pepper. Bring to a boil. Reduce heat and simmer 20 minutes or until rice is tender and water has been absorbed. Meanwhile, cut off the top of the pumpkin and reserve it. Scoop out the seeds and pulp. Place pumpkin on a large baking dish. After the rice is cooked, add the egg, water chestnuts, mushrooms, bell pepper, soup, sage and oregano to the rice/beef mixture and combine thoroughly. Spoon rice/beef mixture into the pumpkin. Replace the the pumpkin top. Place in oven and bake for 1 1/2 hours or until pumpkin is tender. When serving, spoon out portions of the stuffing mixture along with some of the pumpkin flesh. This recipe can also be used to make individual portions using miniature sugar pumpkins. Slice the tops off the pumpkins and set aside. Scoop out the seeds and pulp. Place cleaned pumpkins on a large baking sheet. In a large bowl, combine apples, walnuts, brown sugar, white sugar, lemon juice and lemon zest. Sift together flour, nutmeg, cinnamon, allspice and cloves. Add to apple mixture and toss until all apples are coated. Divide mixture and spoon into each pumpkin. Replace the tops and bake in oven for 1 hour, or until pumpkin is tender. In a large mixing bowl, cream together eggs, sugar, oil and pumpkin until fluffy. In a separate bowl, sift together flour, baking powder, baking soda, cinnamon, nutmeg, cloves and salt. Stir flour mixture into pumpkin mixture until well combined. Spread evenly into an ungreased, 10x15 inch jellyroll pan. Bake for 25-30 minutes in oven. When a toothpick inserted into center comes out clean, remove from oven and let cool on cooling rack. To make the frosting, beat together cream cheese and butter in a medium bowl. Stir in vanilla. Sift together powdered sugar and cinnamon and add to cream cheese mixture a little at a time, beating until smooth. Spread evenly over pumpkin bars after they have cooled completely. Cut into squares before serving. We hope you enjoy these sweet and savory pumpkin recipes as much as our family does.